Emily Chubbuck Judson (1817–1854) was a nationally known writer of the mid-nineteenth century. With pieces appearing alongside those by Edgar Allan Poe and James Fenimore Cooper, she walked in literary company second to none. She wrote children’s books, essays, and stories. During her fascinating life, she was a prolific letter writer. In 1845, she met Adoniram Judson and they married in 1846. His work in Burma (Myanmar) had made him famous as a Baptist missionary. After his death in 1850, Emily returned to the States in 1851 and spent the last years of her life writing and publishing a volume of poetry, a volume of missionary stories, a memoir of her sisters who had died as young women entitled My Two Sisters and helped to produce a biography of her husband. 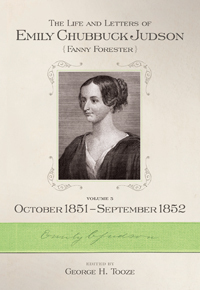 Volume 5 covers October 1, 1851–September 30, 1852. This is the year that Emily Judson worked with Dr. Francis Wayland, president of Brown University, on preparing A Memoir of the Life and Labors of Rev. Adoniram Judson, D.D. This volume is filled with letters from prominent ministers and missionaries of that time, all of whom were involved in the mission movement, and whose lives and ministries had been greatly impacted by Adoniram Judson. There is also correspondence from the Judson children who took Emily as their “new Mamma.” The six-volume series of The Life and Letters of Emily Chubbuck Judson is published in cooperation with the American Baptist Historical Society.